This product has been assayed by ELISA against 0.1 µg of the immunizing peptide. A 1/4000 to 1/16000 dilution of the antibody is recommended for this assay. Synthetic peptide corresponding to Human AKT2 aa 455-468 conjugated to Keyhole Limpet Haemocyanin (KLH). Our Abpromise guarantee covers the use of ab9763 in the following tested applications. WB 1/1000. Detects a band of approximately 60 kDa (predicted molecular weight: 56 kDa). General protein kinase capable of phosphorylating several known proteins. Expressed in all human cell types so far analyzed. Phosphorylation on Thr-309 and Ser-474 is required for full activity. Ubiquitinated; undergoes both 'Lys-48'- and 'Lys-63'-linked polyubiquitination. TRAF6-induced 'Lys-63'-linked AKT2 ubiquitination. When fully phosphorylated and translocated into the nucleus, undergoes 'Lys-48'-polyubiquitination catalyzed by TTC3, leading to its degradation by the proteasome. myristoylation sequence and becomes phosphorylated and activated. The blot shows 0m, 15m, and 30m of 4OHT treatment (which has no effect on endogenous Akt2, but causes a band shift upwards in the MyrAkt2). Endogenous Akt2 runs at about 60kDa whereas the myristoylated construct runs at around 110kDa. 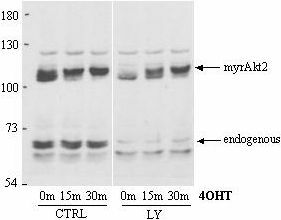 The second panel of 3 lanes is pretreated for 15min with 25uM LY294002 which affects the phosphorylation of endogenous Akt2 but has no effect on phosphorylation of the myristoylated construct. This confirms that the antibody picks up phosphorylated and non-phosphorylated forms of Akt2 whether it be endogenous or transfected in. 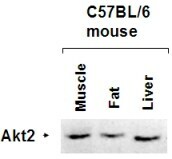 ab9763 tested in Western blot with mouse tissues. This image was kindly provided as part of the review Jianping Ye. ab9763 tested in Western blot with mouse tissues. This image was kindly provided as part of the review Jianping Ye. ab9763 has not yet been referenced specifically in any publications. Publishing research using ab9763? Please let us know so that we can cite the reference in this datasheet. Thank you for your e-mail. Each on-line product datasheet has the current price in 3 different currencies GBP, USD and Euro, please take a look at the documents - you may find further useful information about these antibodies. You just need to select the country name: Hungary and then click on the - Select country to see price - button. https://www.abcam.com/index.html?pageconfig=datasheet∫AbID=5919 https://www.abcam.com/index.html?pageconfig=datasheet∫AbID=9763 https://www.abcam.com/index.html?pageconfig=datasheet∫AbID=5918 https://www.abcam.com/index.html?pageconfig=datasheet∫AbID=4796 Ab5919: original price Euro330.00 -50% discount =165.0 Ab9763: original price Euro165.00 -50% discount = 82.5 Ab5918: original price Euro305.00 -50% discount =152.5 Ab4796: original price Euro330.00 –50% discount =165.0 Total discounted price for these 4 antibodies: Euro 565.00 The shipping and package charges to Hungary are GBP 42.00 or Euro 63.00. Let me know if you need any further information.